Most monuments in Windhoek, the Namibian capital, are located within walking distance from each other, near city center. Allow a couple of hours for the walking tour. Monuments in Windhoek, opened during colonial times, commemorate mostly events from German or South African point of view. The southern wing and central building were built in 1912.The northern wing was added in 1929, built in the same architectural style - difference is not noticeable. A narrow-gauge locomotive (gauge 600 mm) has been mounted on stand in front of the station after running between Swakopmund and Otavi from 1904 to 1939. The engine was built in Germany in 1903 and assembled in Swakopmund. This memorial near the railway station was erected by members of the South African Army in memory of their comrades killed on the 6th of February, 1917 near Ehole (Oihole) in a battle against uprising of King Mandume Ndemufayo of Kwanjama. He was killed in action and his head was cut off. Erected in early 60's. Commissioned and donated by Mr. Behnsen, businessman and owner of firm Metje and Ziegler, Ltd. Commemorates a period when a disease struck kudu population and nearly wiped them out. Established in the beginning of the century. Changes were made in 1962 and the Garden was extended. The northwest corner of the garden with its open-air theater and pergola is of special interest, further the children's playground. High Court building. Built in 1908. Remained in use till late 60's when the new High Court building was opened near Kudu Monument. Presently serves as a headquarters of Veterinary Division of the Ministry of Agriculture. The oldest building in Windhoek (1890). The foundation stone of the fort was laid by Curt von Francois on 18 October 1890. The building was expanded and had some 54 rooms in 1912. Alte Feste served as a headquarters of Schutztruppe and from 1915 as a headquarters of South African troops. From 1935 was used as a hostel for Windhoek High School and from 1962 it is a museum. The memorial bearing a golden eagle, which stands in the middle of the lawns, was erected by order of Governor Leutwein in 1897 in memory of those killed before 1897. At the corner of Peter Muller Street and Independence Avenue, adjoining the southern end of the Zoo Garden. The Fountain was a donation of the Chamber of Commerce. This monument was erected in memory of Major Curt von Francois. Unveiled on the 18th of October 1965. The statue is almost 18 ft. tall. The idea to build a church for the German Evangelical Lutheran congregation was voiced in 1900 but these plans had to be shelved during Nama and Herero uprisings. Construction was started in 1907. These buildings are probably two of the earliest in Windhoek, apart from Alte Feste. Built in mid 1890 for artillery division of Schutztruppe as an ammunition strore and weapon repair shop. Opposite the Municipality. Built in 1893, after 1900 it was enlarged and a gabled roof was added. Erected at the suggestion of the commanding officer of the Schutztruppe, Col. Ludwig von Estorff. The memorial commemorated German soldiers and civilians killed in Nama and Herero uprisings (1903-1907 and 1908). It was unveiled on 27 January 1912, the birthday of Kaiser Wilhelm. Architect Gottlieb Redecker. Built in 1907 as a maternity home and named after Duchess Elizabeth zu Mecklenburg, wife of the President of German Colonial Company. Until the closure of the building as a maternity home in 1981, some 12 669 babies were born there. The oldest building is former Hotel Kronprinz (1901-02). Gathemann building was erected in 1913 and expanded in 1926/7 and Erkrath building (1910) is the last to the right. Architect Wilhelm Sander. At the beginning of the century there were four breweries in the country: Kronen Brewery in Swakopmund, Omaruru Brewery, Klein Windhoek Brewery and Felsenkeller Brewery in Tal valley in Windhoek. The demand for local beer was increasing rapidly and the brewery was expanded in 1912. After World War 1 a number of German citizens were deported back to Germany and smaller breweries had to close down. Omaruru and Klein Windhoek breweries were purchased by Herman Olthaver and Carl List. Hnasa Brewery joined the Consortium in 1968 when the South West Breweries were formed, renamed to Namibia Breweries after Independence. Located next to Hochland road and the oldest know cemetery in Windhoek. The first identifiable grave is of Zacharias Kukuri who was buried on 18 April 1905. Ehrenfield Nganjako was the last person buried there on 4 November 1926. Discovered by James Alexander in 1838. The memorial was erected to commemorate "Bittereinders" of the Second Anglo-Boer War (1899-1902). A number of Boers where forced to flee South Africa and they settled in South West Africa (Namibia). Previously served as the residence of the Governor. At present it is the residence of the President of Namibia. Located on the both sides of Robert Mugabe Av. The graveyard was closed in 1927. A "Cross of Sacrifice" was unveiled on 11 November 1981 as a memorial for the victims of WW 2. The former German administrative building, "Tintenpalast" ("palace of ink") was built in 1913 at the cost of 414 888.84 Mark. 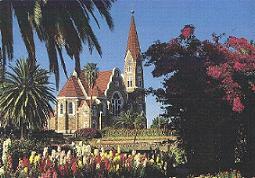 In 1931 the Municipality of Windhoek undertook the laying out of the gardens in front of the building. During 1932 some 300 Olive trees were planted. The tower of this castle was built by Curt von Francois during the time of construction of Alte Feste. In 1904 the army sold the tower to Wilhelm Sander, well known architect, who converted the place to a beer garden. In 1913 was bought by Dr. Hans Bogislav Graf von Schwerin, who engaged W. Sander to convert the tower into a castle. Presently a residence of Italian Ambassador to Namibia. The castle was built by Wilhelm Sander in 1914 and bought 1916 by the Countess von Schwerin (born Heynitz). Presently used as a hotel: Heinitzburg. Built by Wilhelm Sander in 1916 as a residence for himself. Presently a private house.